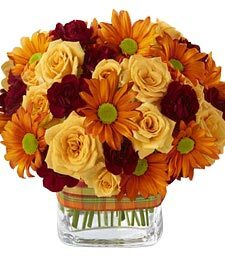 Toast the rich splendor of autumn with this exquisite assortment of fall glory! With bright roses, vibrant blossoms, and festive accents arranged by a professional florist, this display truly captures the golden essence of nature’s beauty. Celebrate in style—order today!